There’s so much going on at the Edinburgh Festival, and not only strictly-speaking Festival things, but also other events capitalising on the crowds that the Festival brings. Like the Jane Austen evening we stumbled upon that was being held by Charlotte Chapel, a church that can be found in the pretty pedestrian, bunting-lined Rose Street. Like pilgrims, we journeyed to Rose Street on Friday evening to attend the event, secure in the knowledge that any evening devoted to Austen would be a good one. We arrived, and, intriguingly, were among a crowd of women only. – Who can say what the title of Pride and Prejudice was originally going to be? Options: “First Impressions”, “Elizabeth and Darcy”, or “Pemberley”. – Also, which actor prompted a phone call from the Jane Austen Society to the director to complain that he was too handsome to play his assigned role? Options: Greg Wise (Willoughby), Hugh Grant (Ferrars), or Colin Firth (Darcy). It was a small, intimate affair – maybe 100 of us, tops? – and I really enjoyed it. One lady played Jane, sitting at the desk in the picture above, and she would read aloud extracts from Jane’s letters to her sister, Cassandra, wherein Jane would introduce her latest book and explain the primary themes she addressed in it. Other women from Charlotte Chapel would then appear, dressed in regency costume, and read relevant extracts from the novels. Sometimes snippets from some of the TV/film adaptations were also shown. My only complaint is that they used the BBC Emma when wanting a scene from that story, and I can’t stand that version; the 1996 McGrath version is superior in every way, from casting to directing to editing to … well, yes, everything. Gwyneth Paltrow and Jeremy Northam forever! – Jane was very concerned with showing a development in self awareness in her heroines, and often her lead males too, Elizabeth and Darcy being prime examples. Only Fanny Price didn’t really need a journey of self-realisation, but rather it was those around her, like Edmund, that needed to learn a thing or two about themselves. – Of all her heroines, Jane liked Elizabeth the best. Me, I have more sympathy with Emma and Anne. – Jane dreamt up the independent and wilful Emma in response to complaints from her readers that her last heroine, Fanny, was too much of a doormat. At the very end, a 30ish, single lady from the church chatted about how Jane’s preoccupation with marriage was very understandable, given that women of that period could only find any kind of financial or practical security through a husband. She then asked why, as modern women, we are still as preoccupied with romance and marriage, since we no longer need it to be financially secure? She pointed to our desire to have a relationship with someone who will love us and meet all our needs. Jesus, she said, is the only one who can actually be that person for each of us. Charlotte Chapel seemed a really lovely, motivated church, and I was glad to have visited. I really admire them. Afterwards, we walked home, a stroll of at least an hour that took us first through Princes Street Gardens, then up and over the Mound, before dropping us down again alongside Bruntsfield Links and our little res. As a South African, I have to give a nod to the awesomeness that is a late evening stroll through the city without a care for safety. So, yes: a big nod to that. Answers: “First Impressions” and Hugh Grant. For more posts from “Megan’s UK diary”, go to Chatsworth House forever, The green spaces of Sheffield and Edinburgh shows off. 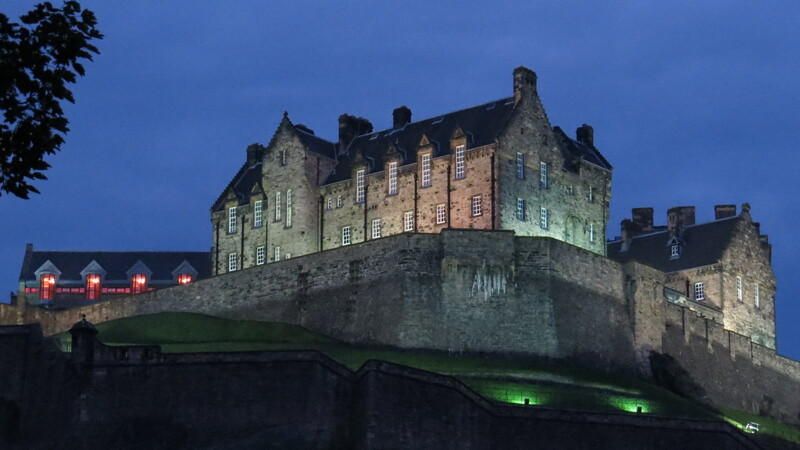 Wow, how stunning to just see that castle on your walk home, wow! Play sounds just up your alley and the church sounds quite amazing! Love you! It really was pretty awesome, Em 🙂 The photo doesn’t really show how high up above you it is. It’s such an impressive sight, and I hadn’t seen it lit up before. Hopefully you’ll see it one day too! So glad you enjoyed your evening at Charlotte Chapel. 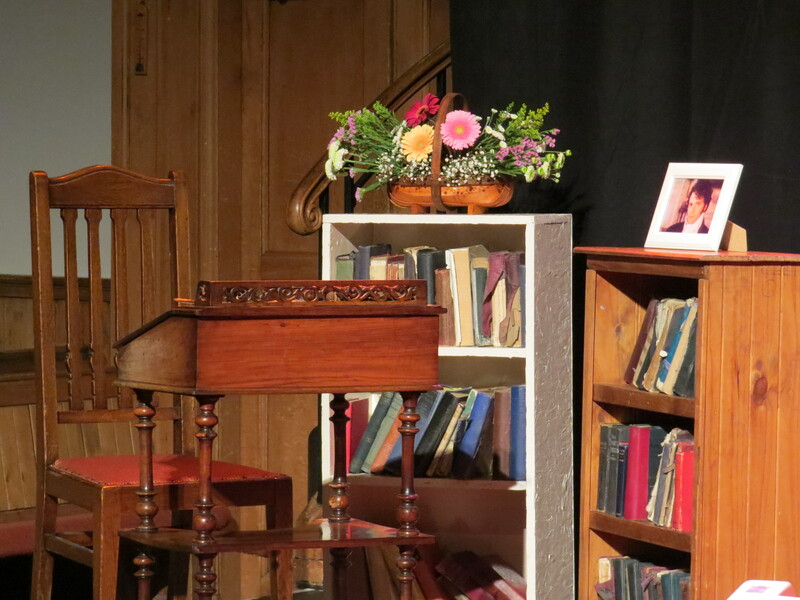 We enjoyed putting on ‘An Evening with Jane Austen’ and it is lovely to read your comments. I hope you enjoyed the rest of your time in Edinburgh. We really did enjoy the evening, and were chuffed when some last min tickets were found for us. I did enjoy Edinburgh, thanks. I’ve just been to Haddon Hall today, which was used, as you may well know, in the latest Pride and Prejudice. So Austen related things have been popping up throughout my trip, which suits me just fine!